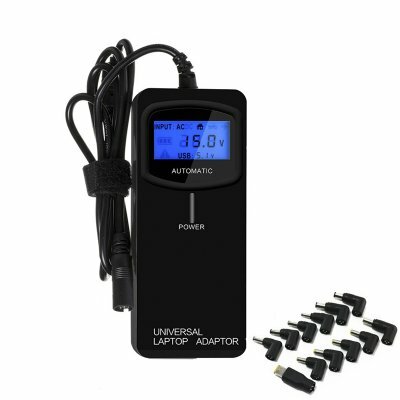 Successfully Added Universal Laptop Adapter - 12 Different Head Pieces, Car Charger, 90 Watt, Overload Protection, Short Circuit Protection to your Shopping Cart. Efficiently charge all your devices with this universal laptop adapter. No longer will there be the need to carry along a bag filled with adapters and charging cables while you head out on your next holiday as this universal charging kit comes with no less than 12 end-pieces. Additionally, this kit also comes with a car charger plug-in – allowing you to charge all your devices while on the road and ensuring that you’ll never be left without battery life again. We all know the pain of searching for that right charging cable that fits your laptop. With this multi-adapter at hand, however, this will be an issue of the past. Supporting an abundance of end pieces, this universal adapter allows you to charge electronics from all the major brands out there. Whether you’re using Toshiba, HP, Samsung, Dell, Lenovo, or any other major brand – with this charger you can be assured that you’ll always be able to charge your device. From now on when your friends come over to your place for a productive study night or to simply enjoy some gaming together, you will always be able to provide their electronics with the extra juice needed to get through the night. With this universal laptop charger you won’t only be able to charge your own device, but also that of all your friends no matter the brand that they are using. Its car charger head additionally allows you to charger your own and other’s electronics while on the move, ensuring that nobody will ever be bored in your car again as your upcoming road trips will be packed with mobile fun and entertainment. Featuring both overload protection and short circuit protection, this cool electronic accessory guarantees that your beloved laptop is safe at any time while charging. Its display additionally shows you the voltage used while charging and the current status of your battery – allowing you to use it in the most efficient manner. Whether you’re at home or on the read, from now on you, your friends, and family no longer have to worry about carrying the right cables or running out of juice in general as this multi-charger is there to provide power to all your electronic devices. This universal laptop charger comes with a 12 months warranty, brought to you by the leader in electronic devices as well as wholesale electronic gadgets..